Gregory of Nyssa (Latin:Gregorius Nyssenus, Greek: Άγιος Γρηγόριος Νύσσης) (ca. 335–ca. 394 C.E.) was a Christian bishop and saint. He was a younger brother of Basil the Great, and a good friend of Gregory Nazianzus. These three saints, collectively referred to as the Cappadocian Fathers, were instrumental in defining and defending Christian theology during a particularly volatile period of theological development. Among this august company, Gregory "was, by most reckoning, the greatest speculative theologian of the three." His significance has long been recognized in Anglican, Lutheran, Eastern Orthodox, Oriental Orthodox, and Roman Catholic Christianity, all of which celebrate his memory through a commemorative feast day in the Calendar of Saints. Gregory was born circa 335 C.E. at Caesarea Mazaca in Cappadocia. One of ten children, he came from a wealthy and pious family that produced a number of saints, including his father Basil, his mother Emelia, his grandmother Macrina the Elder, his sister Macrina the Younger, and his brothers Basil and Peter, the latter of whom became the Bishop of Sebaste. Though existing records do not confirm this, it appears that Gregory was orphaned at a relatively young age, as he was raised by his elder siblings, Basil and Macrina. As suggested by Butler, these circumstances were evidently formative for the future saint: "in a letter to his younger brother Peter, Gregory speaks of Basil as 'our father and master', and throughout his life he looked up to him with the greatest affection and veneration." After departing from his childhood home, Gregory received an exhaustive education in Athens and eventually accepted a post as a professor of rhetoric at a prestigious academy. After remonstrations from both Basil and Gregory of Nazianzus, the younger Gregory eventually forswore his secular life and accepted a posting as the bishop of Nyssa in 372 C.E. This particular posting served a political purpose for the strategically savvy Basil, as it provided him with an episcopal ally near the metropolitan See of Caesarea (his own diocese). Such long-term planning was becoming increasingly necessary, as the Church was then enmired in the Arian controversy. Unfortunately for Basil, Gregory's naturally sanguine nature (coupled with the predominantly Arian composition of his diocese) were a disastrous combination, and he was eventually driven from his episcopal seat amidst claims of mismanaged funds. In spite of these accusations (which were eventually dismissed), Gregory's theological acumen allowed him to return to a position of prominence, culminating in his participation in the Council of Antioch and the Second Ecumenical Council in Constantinople (381 C.E.). In both cases, he defended the orthodox Nicene position against the heretical doctrines of the Arians and the Melitians, a responsibility that was made all the more acute by the death of Basil in 379. After many fruitful years of preaching and writing, the saint passed away in Cappadocia (ca. 394). Gregory is remembered above all for two major contributions to theology. The first is his doctrine of the Trinity, a development of the theology of Basil and their mutual friend Gregory Nazianzus. Following Basil's lead, Gregory argues that the three Persons of the Trinity can be understood along the model of three members of a single class: thus, the Father, Son, and Holy Spirit are three in the same way that Peter, Paul, and Timothy are three men. So why do we not say there are three Gods? Gregory answers that, normally, we can distinguish between different members of the same class by the fact that they have different shapes, sizes, and colors. Even if they are identical, they still occupy different points in space. But none of this is true of incorporeal beings like God. Even lesser spiritual beings can still be distinguished by their varying degrees of goodness, but this does not apply to God either. In fact, the only way to tell the three Persons apart is by their mutual relations—thus, the only difference between the Father and the Son is that the former is the Father of the latter, and the latter is the Son of the former. Since, then, the character of the superintending and beholding power is one, in Father, Son, and Holy Spirit, … issuing from the Father as from a spring, brought into operation by the Son, and perfecting its grace by the power of the Spirit; and since no operation is separated in respect of the Persons, being fulfilled by each individually apart from that which is joined with Him in our contemplation, but all providence, care, and superintendence of all, alike of things in the sensible creation and of those of supramundane nature, and that power which preserves the things which are, and corrects those which are amiss, and instructs those which are ordered aright, is one, and not three, being, indeed, directed by the Holy Trinity, yet not severed by a threefold division according to the number of the Persons contemplated in the Faith, so that each of the acts, contemplated by itself, should be the work of the Father alone, or of the Son peculiarly, or of the Holy Spirit separately, but while, as the Apostle says, the one and the selfsame Spirit divides His good gifts to every man severally, the motion of good proceeding from the Spirit is not without beginning;—we find that the power which we conceive as preceding this motion, which is the Only-begotten God, is the maker of all things; without Him no existent thing attains to the beginning of its being: and, again, this same source of good issues from the will of the Father. If, then, every good thing and every good name, depending on that power and purpose which is without beginning, is brought to perfection in the power of the Spirit through the Only-begotten God, without mark of time or distinction (since there is no delay, existent or conceived, in the motion of the Divine will from the Father, through the Son, to the Spirit): and if Godhead also is one of the good names and concepts, it would not be proper to divide the name into a plurality, since the unity existing in the action prevents plural enumeration. And as the Saviour of all men, specially of them that believe is spoken of by the Apostle as one, and no one from this phrase argues either that the Son does not save them who believe, or that salvation is given to those who receive it without the intervention of the Spirit; but God who is over all, is the Saviour of all, while the Son works salvation by means of the grace of the Spirit, and yet they are not on this account called in Scripture three Saviours (although salvation is confessed to proceed from the Holy Trinity): so neither are they called three Gods, according to the signification assigned to the term “Godhead,” even though the aforesaid appellation attaches to the Holy Trinity. Gregory's second major contribution to Christian theology was in the realm of metaphysics, where he has the distinction of being one of the first Christian theologians to argue for the infinity of God. More specifically, Gregory argues that if God is limited he must logically be constrained by something greater than himself. As there is nothing greater than God, He is therefore without boundaries, and thus infinite. The idea had already been developed by Neoplatonic philosophers, especially Plotinus, another important influence on Gregory, but he is among the first Christians to defend it, apart from some hints in the work of Irenaeus and in one of Basil's letters. the Christian traditional belief in a volitional and temporal act of creation ex nihilo is interpreted by Gregory of Nyssa to mean a volitional and temporal act of emanation from God. Now from a comparison of his statement that God brings all things "from nothing" into existence" and his statement that "all things come from God" it is quite evident that the phrase "from nothing" in the former statement is used by him in the sense of the phrase "from God" in the latter statement. … Thus, matter, including the intelligible matter in God prior to its emanation, is described as "nothing" in the sense of its being "by itself" incapable of being "grasped by reason" or incapable of existing in our mind as a "concept"; in short, in the sense of its being incomprehensible. Given his apophatic approach to theology (described above), Gregory suggests that the religious life must eventually transcend intellectual knowing and ground itself faithful praxis. In this, he broke with his predecessor Origen, who described the spiritual journey as a progression of increasing illumination, as with the mystic study Scripture which yields ever increasing knowledge of God. While Nyssa agrees with the knowability of such manifestations, he suggests that the true religious path must ultimately transcend knowledge (gnosis) and embrace pure faith, as such transcendence is the only means of entering into a true communion with God. It is the height of hubris, in his view, to base a religious life upon preconceived notions of the Divine. This perspective is extensively outlined in the saint's Life of Moses. Gregory speaks of three stages: initial darkness of ignorance, then spiritual illumination, and finally a darkness of the mind in contemplation of the God who cannot be comprehended. Like earlier authors, including Philo, he uses the story of Moses as an allegory for the spiritual life. Moses first meets God in the burning bush, a theophany of light and illumination, but then he meets him again in the cloud, where he realizes that God cannot be seen by the eyes. Ascending Mount Sinai, he finally comes to the "divine darkness," and realizes that God cannot be known by the mind either. It is only through not-knowing and not-seeing that God can, paradoxically, be known and seen. This notion would be extremely influential in both Western and Eastern spirituality, via the mystical writings of Pseudo-Dionysius the Areopagite, and later in the anonymous fourteenth century work, The Cloud of Unknowing. Thus, Gregory is seen as a major figure in the history of apophatic theology and spirituality. [D]ivine infinity, as the primary attribute of God outstripping all other predications, has as its logical corollary the infinity of the human ascent to God: God's absolute transcendence is not an object for despair, and, once acknowledged rationally, does not frustrate the soul's innate and never-ending desire for God. In turn, the diastemic gulf between infinite God and finite creatures is not just a stopping-point for human knowledge of God, but an open field of action, of eternal movement and self-realization. This idea has had a profound influence on the Eastern Orthodox teaching regarding theosis or "divinization." This apophatic, mystical perspective was simply incompatible with a literalist approach to Christian holy texts, which led Gregory to promote the allegorical interpretation of scripture. He defends this choice in the introduction to his homilies on the Song of Songs: "It is possible to collect thousands [of] citations from the rest of the prophets, to show the necessity of an insight into the sense of the words. If such an interpretation is rejected, as some prefer, the result seems similar to me to what would happen if someone were to serve unprocessed grain as food at a meal for men, not grinding the ears, not winnowing the chaff from the grains, not thrashing the wheat on the threshing floor, nor preparing bread in the usual manner for use as food. Just as unprocessed grain is food for beasts, so someone might say the divinely inspired words unprocessed by winnowing insight are food for the irrational, rather than for the rational. This is true not only of the Old Testament, but of much of the gospel teaching. ↑ Mike Aquilina. The Fathers of the Church: An Introduction to the First Christian Teachers. (Huntington, IN: Our Sunday Visitor, 1999), 151. ↑ Alban Butler. Lives of the Saints, Edited, revised, and supplemented by Herbert Thurston and Donald Attwater. (Palm Publishers, 1956), 533. ↑ David Hugh Farmer. The Oxford Dictionary of Saints. (Oxford; New York: Oxford University Press, 1997), 223. ↑ H. Leclercq, "St. Gregory of Nyssa" in the Catholic Encyclopedia. 1910. ↑ Gregory of Nyssa, "On 'Not Three Gods,'" Gregory of Nyssa: Dogmatic Treatises, Etc., A Select Library of the Nicene and Post-Nicene Fathers of the Christian Church - Second Series, Volume 5. (New York: Christian Literature Publishing Co., 1892.) Accessed online at: Christian Classics Ethereal Library.Retrieved March 29, 2008. ↑ Though it has become customary to translate Gregory's writings using the standard Christian "He" and "Him" to describe God, it is notable that the saint's Platonic heritage belied the application of a simplistic gender identification to the Divine. This phenomenon is explored by Meredith: "So, one of his favorite expressions for God is 'God who is above all', probably an echo of Romans 9:5. An equally favourite expression is the neuter τόθειον, 'the divine', perhaps in allusion to Acts 17:29 but, more probably, to the Greek philosophical tradition beginning with Thales in the sixth century B.C.E. A further illustration of the apparent insouciance of Gregory to this sort of distinction can be seen in his indifference to the use of the masculine or neuter in reference to God as 'He who is' (more biblical) and 'That which is' (more Platonic)" (18). ↑ Anthony Meredith. Gregory of Nyssa. (London and New York: Routledge, 1999), 15-17, 142 ff. 27. ↑ Harry A. Wolfson, "The Identification of Ex Nihilo with Emanation in Gregory of Nyssa." The Harvard Theological Review 63(1) (January 1970): 58-59. ↑ Mühlenberg, summarized by Paul M. Blowers, "Maximus the Confessor, Gregory of Nyssa, and the Concept of 'Perpetual Progress.'" Vigiliae Christianae 46(2) (June 1992), 152. The author then goes on to explore other possible functions of Gregorian epektasis (most namely, its utility as a critique of Origenism), a theory which, while interesting, is outside the scope of the current overview. ↑ "Gregory of Nyssa," quoted in Bart D. Ehrman and Andrew S. Jacobs, Christianity in Late Antiquity: 300 – 450 C.E. (Oxford and New York: Oxford University Press, 2004), 464. Aquilina, Mike. The Fathers of the Church: An Introduction to the First Christian Teachers. Huntington, IN: Our Sunday Visitor, 1999. ISBN 0879736895. Blowers, Paul M. "Maximus the Confessor, Gregory of Nyssa, and the Concept of 'Perpetual Progress.'" Vigiliae Christianae 46(2) (June 1992): 151-171. Ehrman, Bart D. and Jacobs, Andrew S. Christianity in Late Antiquity: 300 – 450 C.E. Oxford and New York: Oxford University Press, 2004. ISBN 0195154614. Gregory of Nyssa. The Life of Moses, Translated and with notes by Malherbe, Ferguson, and Meyendorff. Mahwah, NJ: Paulist Press, 1977. ISBN 0809121123. 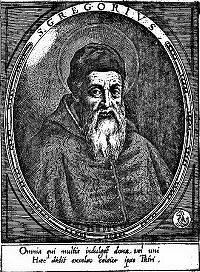 Leclercq, H. "St. Gregory of Nyssa" in the Catholic Encyclopedia. 1910. Meredith, Anthony. Gregory of Nyssa. London and New York: Routledge, 1999. ISBN 0415118409. Wolfson, Harry A. "The Identification of Ex Nihilo with Emanation in Gregory of Nyssa." The Harvard Theological Review 63(1) (January 1970): 53-60. History of "Gregory of Nyssa"